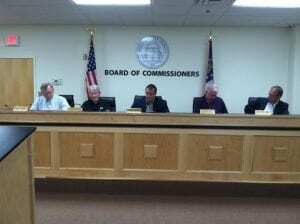 WHITE COUNTY BOARD OF COMMISSIONERS WORK SESSION OF MONDAY, APRIL 24, 2017 AT 4:30 P.M. CONDUCT A PUBLIC HEARING FOR THE LAND USE APPLICATION OF MR. LARRY FREEMAN TO REDISTRICT PROPERTY LOCATED AT 9669 DUNCAN BRIDGE ROAD, CLEVELAND, GA 30528 FROM: R1 RESIDENTIAL SINGLE FAMILY DISTRICT, TO C2 HIGHWAY BUSINESS DISTRICT. TOTAL ACREAGE AFFECTED IS 1.44 ACRES. TAX PARCEL 090-047. PRESENT USE IS R1 RESIDENTIAL SINGLE FAMILY DISTRICT. CONDUCT A PUBLIC HEARING FOR THE LAND USE APPLICATION OF MS. SUE RUSSELL TO REDISTRICT PROPERTY LOCATED AT 1204 AND 1206 RIDGE ROAD, HELEN, GA 30545 FROM: C1 COMMUNITY COMMERCIAL DISTRICT, TO C2 HIGHWAY BUSINESS DISTRICT. TOTAL ACREAGE TO BE AFFECTED IS 1.34 ACRES. TAX PARCEL 042C-021. PRESENT USE IS C1 COMMUNITY COMMERCIAL DISTRICT. CONDUCT A PUBLIC HEARING FOR THE LAND USE APPLICATION OF MS. ELAINE F. REYNOLDS TO REDISTRICT PROPERTY LOCATED AT 1679 HELEN HWY, CLEVELAND, GA 30528 FROM: R1 RESIDENTIAL SINGLE FAMILY DISTRICT, TO C2 HIGHWAY BUSINESS DISTRICT. TOTAL ACREAGE TO BE AFFECTED IS 13.00 ACRES. TAX PARCEL 046-008. PRESENT USE IS R1 RESIDENTIAL SINGLE FAMILY DISTRICT. CONDUCT A PUBLIC HEARING FOR THE LAND USE APPLICATION OF KELLY AND GARY MILLS TO REDISTRICT PROPERTY LOCATED AT 457 HIGHWAY 255 SOUTH, CLEVELAND, GA 30528 FROM: R1 RESIDENTIAL SINGLE FAMILY DISTRICT, TO A1 AGRICULTURE FORESTRY DISTRICT. TOTAL ACREAGE TO BE AFFECTED IS 5.0 ACRES. TAX PARCEL 061-089. PRESENT USE IS R1 RESIDENTIAL SINGLE FAMILY DISTRICT. MR. KEVIN HAMBY, SPLOST MANAGER, TO PRESENT THE MONTHLY SPLOST STATUS REPORT. DISCUSS THE ASSIGNMENT OF SERVICES AGREEMENT WITH SENTINEL OFFENDER SERVICES LLC AND CSRA PROBATION SERVICES, INC. RELATED TO PROBATION SERVICES IN WHITE COUNTY PROBATE COURT & WHITE COUNTY MAGISTRATE COURT. DISCUSS GRANT ACCEPTANCE OF THE 2016 JAG BYRNE GRANT IN THE AMOUNT OF $86,709.00 FROM THE FRANKLIN COUNTY BOARD OF COMMISSIONERS RELATED TO THE ABSORPTION OF THE NORTH GEORGIA DRUG TASK FORCE BY THE APPALACHIAN REGIONAL DRUG ENFORCEMENT OFFICE. DISCUSS RENEWAL OF THE MEMORANDUM WITH THE ENOTAH JUDICIAL CIRCUIT COUNTIES TO CONDUCT ACTIVITIES FOR THE ENOTAH JUDICIAL CIRCUIT’S JUVENILE JUSTICE PROJECT COORDINATED THROUGH FAMILY CONNECTIONS. DISCUSS BIDS RECEIVED FOR A MATURED CERTIFICATE OF DEPOSIT (CD) CURRENTLY HELD AT UNITED COMMUNITY BANK IN THE AMOUNT OF $169,400.00. DISCUSS BIDS RECEIVED FOR THE LOCAL MAINTENANCE IMPROVEMENT GRANT (LMIG) BRIDGE REHABILITATION PROJECT RELATED TO ONE (1) BRIDGE ON TOWN CREEK ROAD AND TWO (2) BRIDGES ON NEW BRIDGE ROAD. DISCUSS UPGRADE TO THE ROAD DEPARTMENT’S CHIPPER. DISCUSS BIDDING PROCESS OF CAROLINA SPRINGS ROAD (BIDS DUE APRIL 28, 2017). DISCUSS PROPOSALS FOR THE YONAH PRESERVE PROJECT CONSTRUCTION MANAGER AT RISK PROPOSAL PROCESS (PROPOSALS DUE APRIL 27, 2017). MR. DAVID MURPHY, DIRECTOR OF PUBLIC SAFETY, TO PRESENT THE PUBLIC SAFETY ANNUAL REPORT. DISCUSS GRANT ACCEPTANCE FOR WHITE COUNTY EMERGENCY MANAGEMENT AGENCY (EMA) RELATED TO A PORTABLE GENERATOR GRANT IN THE AMOUNT OF $59,580.00 (COUNTY BUDGETED MATCH $8,937.00) FROM FEDERAL / GEORGIA EMERGENCY MANAGEMENT AGENCIES (FEMA / GEMA). DISCUSS GRANT ACCEPTANCE FOR THE WHITE COUNTY EMERGENCY MANAGEMENT AGENCY (EMA) RELATED TO A GRANT FOR WEATHER STATION LOCATED AT WHITE COUNTY HIGH SCHOOL IN THE AMOUNT OF $38,823.00 (COUNTY BUDGETED MATCH$5,824.00) FROM FEDERAL / GEORGIA EMERGENCY MANAGEMENT AGENCIES (FEMA / GEMA). DISCUSS OPTIONS FOR THE 2017-2018 EMPLOYEE BENEFITS RENEWAL. REVIEW THE AGENDA FOR THE MAY 1, 2017 REGULAR MEETING. CONSIDER THE LAND USE APPLICATION OF MR. LARRY FREEMAN TO REDISTRICT PROPERTY LOCATED AT 9669 DUNCAN BRIDGE ROAD, CLEVELAND, GA 30528 FROM: R1 RESIDENTIAL SINGLE FAMILY DISTRICT, TO C2 HIGHWAY BUSINESS DISTRICT. TOTAL ACREAGE AFFECTED IS 1.44 ACRES. TAX PARCEL 090-047. PRESENT USE IS R1 RESIDENTIAL SINGLE FAMILY DISTRICT. CONSIDER THE LAND USE APPLICATION OF MS. SUE RUSSELL TO REDISTRICT PROPERTY LOCATED AT 1204 AND 1206 RIDGE ROAD, HELEN, GA 30545 FROM: C1 COMMUNITY COMMERCIAL DISTRICT, TO C2 HIGHWAY BUSINESS DISTRICT. TOTAL ACREAGE TO BE AFFECTED IS 1.34 ACRES. TAX PARCEL 042C-021. PRESENT USE IS C1 COMMUNITY COMMERCIAL DISTRICT. CONSIDER THE LAND USE APPLICATION OF MS. ELAINE F. REYNOLDS TO REDISTRICT PROPERTY LOCATED AT 1679 HELEN HWY, CLEVELAND, GA 30528 FROM: R1 RESIDENTIAL SINGLE FAMILY DISTRICT, TO C2 HIGHWAY BUSINESS DISTRICT. TOTAL ACREAGE TO BE AFFECTED IS 13.00 ACRES. TAX PARCEL 046-008. PRESENT USE IS R1 RESIDENTIAL SINGLE FAMILY DISTRICT. CONSIDER THE LAND USE APPLICATION OF KELLY AND GARY MILLS TO REDISTRICT PROPERTY LOCATED AT 457 HIGHWAY 255 SOUTH, CLEVELAND, GA 30528 FROM: R1 RESIDENTIAL SINGLE FAMILY DISTRICT, TO A1 AGRICULTURE FORESTRY DISTRICT. TOTAL ACREAGE TO BE AFFECTED IS 5.0 ACRES. TAX PARCEL 061-089. PRESENT USE IS R1 RESIDENTIAL SINGLE FAMILY DISTRICT. CONSIDER OPTIONS FOR THE 2017-2018 EMPLOYEE BENEFITS RENEWAL. CONSIDER ENTERING INTO EXECUTIVE SESSION IN ORDER TO DISCUSS PERSONNEL.